Please excuse my noob question but where does the Bhagavat-gita fit in here? Bhagavad-gītā is a chapter in Mahābhārata. See the square for Mahābhārata? 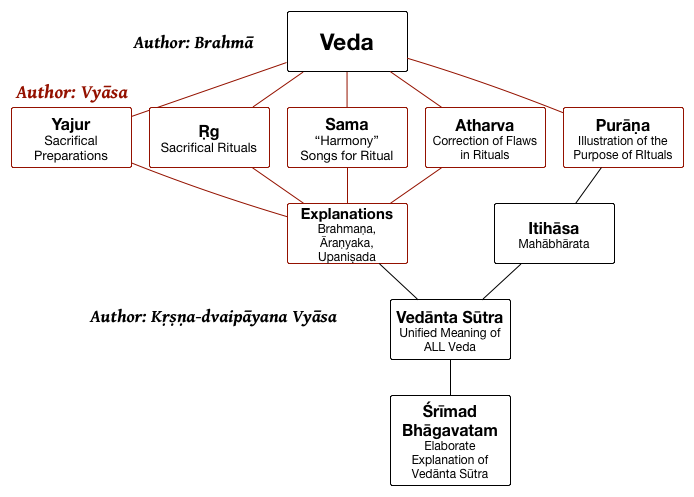 About 80% of the Four Veda is lost. So reading it is just confusing. The Purāṇa are relatively complete, but enormous. There are three grades of Purāṇa though so you should focus on the 6 Purāṇa especially designed for your basic need (as raja, sattva, or tamas). Since most of us are trying to get transcendental knowledge from the Veda, we should direct ourselves to the sattva Purāṇa. Still, studying the 6 sattva Purāṇa is a very significant undertaking, and it will be confusing to reconcile all the angles and varieties of statements in the dozens of thousands of verses in all those Purāṇa. That is why Kṛṣṇa-dvaipayana Vyāsa wrote Mahābhārata. But after finishing Mahābhārata he worried that people would just focus on the setting, the storyline, and not pay attention to or comprehend the philosophical content (mainly the Gītā). So after Mahābhārata, he wrote Brahma-sūtra – which explains all the Veda in one very short book. The problem is that it’s TOO short, it becomes like a complex symbolic code, difficult to decode and understand. So, finally, he wrote the Śrīmad Bhāgavatam to clearly and elaborately explain the meaning and purpose of the Brahma-sūtra (and thus the entire Veda). So, all we really need to study is Śrīmad Bhāgavatam. As someone who has been exposed to Kṛṣṇa/Vaishnavism only through music and lyrics I find it pretty hard reading and trying to understand “Bhagavad-gītā As Is”. That’s why after every chapter I finish, I read the corresponding chapter from you “Simple Gita” to make sure I got the “core message”. It is important to me to try to understand the whole picture, and answers like yours are certainly very helpful. Śrīmad Bhāgavatam is what’s covered in your “Beautiful Tales Of The All-Attractive”-books, if I understand correctly? So I guess I’ll read those after finishing the Gītā.